A Special clutch device is incorporated on the in feed worm and Star wheel system for stoppage of machine in the event of plastic bottle is over turned or over diameter. Damage cap quantity can be reduced by adjusting the gap between upper and lower plate of orientation unit. Imported photocell for cap feeder orientation for automatic control for reducing cap damaging. Toughened glass safety cabinet with safety switches available as a optional. 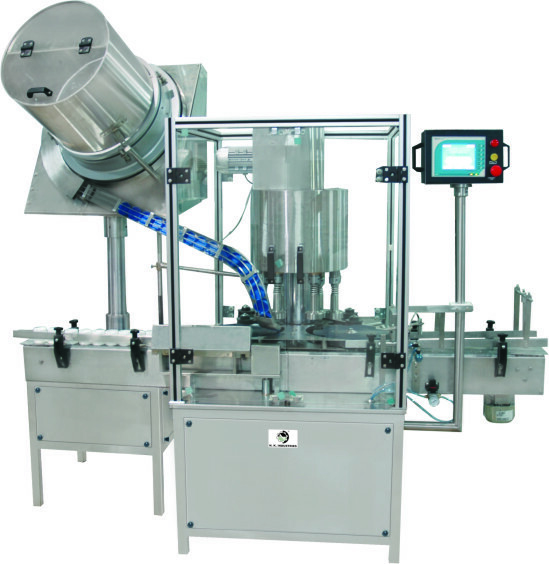 Jar capping machine is a compact model used for sealing of screw Cap on Jar. And available in various configuration according to the out requirement. Jars are continuously fed from upstream machine to the flat conveyor belt of Screw cap sealing machine and move further through in feed worm for correct spacing between two jars and transferred to the in feed star wheel. Screw caps kept in orientation unit automatically orient caps in right direction before entering into delivery chute. And jars is entering below jaw type sealing head and jars will be sealing perfectly.